The return of the Defensive Gun Use Report! We've been away a long time because of a lot of other projects. The stories were still getting posted but nobody was around to compile them into the report. That's over and we're back to sharing what can be found in the media on DGU's. Despite the fact that they happen numerous times each and every day, Defensive Gun Use stories rarely make the media and, when they do, are hard to find. They typically get only local coverage, sometimes as little as a small blurb in the local paper or just a one liner in an online police blotter. Most of the time, there has to be something special about the story or it has to be a really slow local news day to get a DGU in the media. We leave some stories out of our numbers because they are ambiguous or simply don't have enough information to call them defensive gun uses. The sparse coverage for most defensive gun uses means we do our best to get to the facts in the case - if it's not clear cut, it's not in our numbers. Kind of makes you want to read the whole thing, huh? Since we get this report is a narrative, if we just put blurbs on every DGU it would bore you. We keep a comprehensive spreadsheet to track totals and trends, this is a narrative / highlight reel. In March, we had Detroit residents fighting back against the crime wave in their city, women showing criminals why guns are known as force equalizers, and some fun odds and ends like Chicago's first concealed carrier DGU and home invaders taking a shotgun blast to the balls. Robocop had it right (the original one - we refuse to acknowledge the remake). Detroit has turned into a city under siege with rampant crime and the police force overwhelmed. In the movie, the city needed a cyborg police officer to solve the problem. In today's Detroit, armed citizens are protecting themselves, their families and their friends - no cyborg needed. March 6th - A resident shot and killed a home invader. March 22nd - Three robbers planned to lure a Jets Pizza delivery driver with a fake pizza order. Their plan went awry when the driver drew his concealed handgun and opened fire. One thug was shot, the other two fled and likely needed new underwear. March 23rd - The day after being robbed of his TV and XBox, a Detroit man uses his HK416 chambered in .22LR to confront 6 teens trying to break in again. He caught one of them, a 13-year-old, as he tried to flee the scene. They spent 20 minutes waiting for police and having a heart to heart talk at gunpoint. March 24th - A known heroin addict attacked a Home Depot employee by stabbing him with a needle. A concealed carrier saw the attack, drew his gun and ended the attack. March 25th - Another Detroit homeowner who was facing a second burglary in less than a week. This time he was home, drew his handgun, and fired four shots. Both intruders were pronounced dead on the scene. As Gayle Trotter wrote in the Washington Times, "Guns make women safer. In a violent confrontation, guns reverse the balance of power. How do guns give women the advantage? 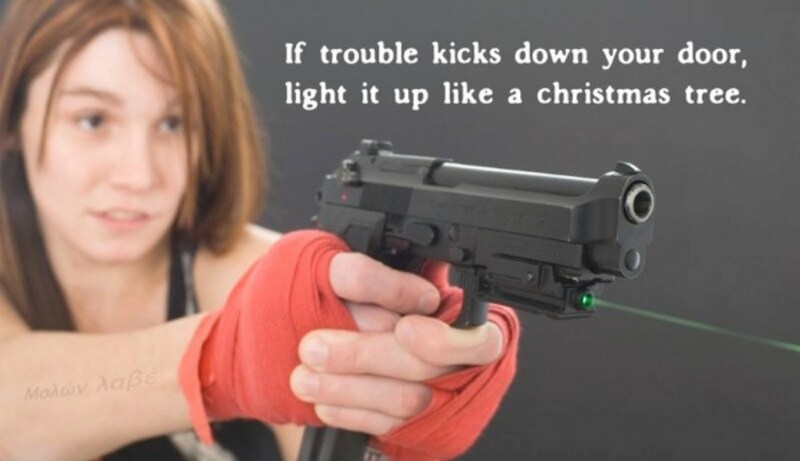 An armed woman does not need superior strength or the proximity of a hand-to-hand struggle. She can protect her children, elderly relatives, herself or others who are vulnerable to an assailant. March 1st - Two weeks after moving to a new home with her children, a Florida woman shoots and kills an intruder. March 5th - "We know that he went to the home uninvited and he went into the home and the female in the home shot him," South Carolina police say after a woman shoots her ex-boyfriend. He had been arrested just days earlier for aggravated domestic violence. March 13th - Another pizza driver? Domino's Pizza delivery driver Ashley Hurd was held up by two men. She drew her concealed handgun and fought back. March 13th - An Oregon woman with extensive firearms training was home sick from work when she confronted an intruder and held him at gunpoint for more than 20 minutes waiting for police to respond. March 17th - A Charlotte, North Carolina woman shot and killed her estranged boyfriend after he kicked in her door with a gun in his hand. March 20th - "He picked the wrong girl," said Lacey Nunnally of Oklahoma after a criminal broke her glass and tried to enter the home. March 22nd - On her first day carrying concealed, a Texas woman drew her handgun and stopped a thug trying to rob another woman at a DART train station. She says she'll be carrying every day now. March 24th - Carole Motsko, a 76-year-old Pennsylvania woman, heard someone inside her house. She called 911, grabbed her shotgun, and told the intruder she was armed and waiting. March 27th - "It was very traumatic for her, but she was also very confident in her (gun-handling) abilities - and she used every one of them that morning," said Police Chief Greg Bean of a 31-year-old Pennsylvania woman who used her large caliber handgun to confront and intruder and order him from her home. March 30th - Three people forced their way into a Texas home and attacked the residents of the home. A woman in the home was able to get to a handgun and open fire. Chicago's First Concealed Carry DGU - After years of being the only state to ban concealed carry, it certainly didn't take long for an armed Chicagoan to send two armed robber skittering away. Chicago is already seeing the crime rate fall in response to the new concealed carry laws. It seems criminals really do prefer unarmed victims. The One Hour Gunfight - This is a story you really have to read to believe. An armed man attempted to rob a Texas gas station. What he got was an hour long gunfight with store employees that ultimately included motor oil cannisters being thrown like grenades. Then he set fire to the store after he was shot - like we said, you really have to read it. Senior Citizen is Shot Three Times; Keeps Fighting - "You came to the wrong house today," said 60-year-old Jeff Gengelman after two men forced their way into his home. A shootout ensued and Jeff was struck three times - including a round that richocheted off one of his ribs - and stayed in the fight. We found a total of 104* Defensive Gun Uses this month, with 29 states showing at least 1 DGU for the month. Texas leads the way as always with 18 and Florida comes in a close second with 10. The longer we do these reports the more I believe it's a difference in reporting that causes the disparity in each state's numbers more than a different incidence rate. We can't stress enough is that these are only the stories we are able to find in the news. If you see a Defensive Gun Use story and would like to help make this report as comprehensive as possible, send it to us through the Contact Us form below, through e-mail, (easybakegunclub@gmail.com), Twitter, or Facebook. We would rather have a story sent in fifty times than miss it because someone thinks we've already seen it. You can search all of the reports on our site (use the search feature if you are only interested in a specific state). We are still working on a searchable database for DGU events that will combine all of the reports and have some great tools. * The original report was 102 Defensive Gun Uses. Since then, two other incidents have been cleared by authorities as clean defensive shootings. This one in Michigan and this one from Virginia. We will. It's back on track now and you should see some improvements each month.